The unprecedented development of public diplomacy in international politics, the activities of civil institutions and the rapid expansion of NGOs in recent decades have been actively used by a number of states for advancing their own political, economic and strategic agenda abroad. There’s little doubt that the United States has been more active in this domain than any other international player, transforming NGOs into a brutal instrument used to allow Washington’s reshaping of the world to suit its own interests. The US State Department actively maintains or cooperates with a number of prominent NGOs, including the National Democratic Institute (NDI), the International Republican Institute (IRI), the Open Society Institute, the National Endowment for Democracy (NED), Freedom House and many others. Such organizations are actively used by the US government for advancing its foreign policy. In fact, over the years they have been turned in structural units of the State Department, acting in the capacity of an ideological mouthpiece that would target any entity bold enough to criticize Washington, and more often than not – as a tool of facilitating a coup d’etat in other states. This, in particular, has been demonstrated by the role American NGOs played in unleashing the wave of “Arab” and “color” revolutions. Instead of using direct military force, the United States has switched to the active use of NGOs to deal with those obstructing Washington’s ambitions. It should be noted that a great many of such NGOs have been specifically created by the US government abroad with the active involvement of US intelligence through money unknowingly provided by the American taxpayers. Thus, it’s curious that the US State Department has been enjoying particularly close ties with the National Endowment for Democracy (NED), which, according to published information on its website is a “private, nonprofit foundation dedicated to the growth and strengthening of democratic institutions around the world.” However, even the first President of NED Carl Gershman openly acknowledged in 1986 that this organization is but a facade of the CIA. 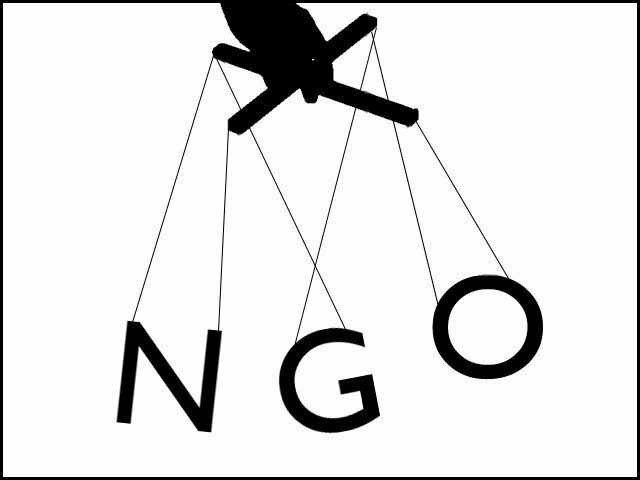 The activities of various American non-governmental organizations (NGOs) compromise the very concept of “non-governmental organization” as impartial and financially independent institutions. It is therefore not surprising that the activities of such NGOs have severely compromised the image of this essential component of a modern civil society. To destabilize the situation in a considerable number of countries who refuse to unquestioningly follow Washington’s dictate, American NGOs have recently begun to take advantage of the Muslim factor. Those entities started recruiting Muslims not only in the Middle East but also in the Caucasus for such terrorist organizations as Al-Qaeda and ISIS. It’s no secret that many international extremist organizations were originally created or supported at a certain stage in history by US intelligence agencies, although the White House has always denied this. In particular, the notorious Al-Qaeda organization was created in order to counter the expansion of the Soviet Union and was heavily subsidized by American taxpayers. The letter from Barbara Feinstein, USAID Deputy Assistant Administrator for Legislative affairs, to NED Vice President Nadia Diuk visibly shows that NGOs in Russia, Ukraine, Byelorussia and Kazakhstan affiliated with the USA have been recruiting young people for ISIS over years. And all this time that’s been quite lucrative business for them. The international community, along with Washington’s think tanks, must realize that the continuation of large-scale interventions in the affairs of other states through a network of NGOs would not just compromise the very concept of non-governmental institutions even further, but would also jeopardize the entirety of US foreign policy. Such activities of the US must be stopped, not only because they are totally illegal, but due to the fact that Washington is no longer in control of a large number of political projects that have been launched abroad through the use of NGOs. The Boston Marathon bombing has clearly showed that terrorists, including those that were to be used against Moscow and Tehran, that were sponsored at the expense of US taxpayers, are joining international terrorist organizations and present a very real danger to the international community and the US alike.